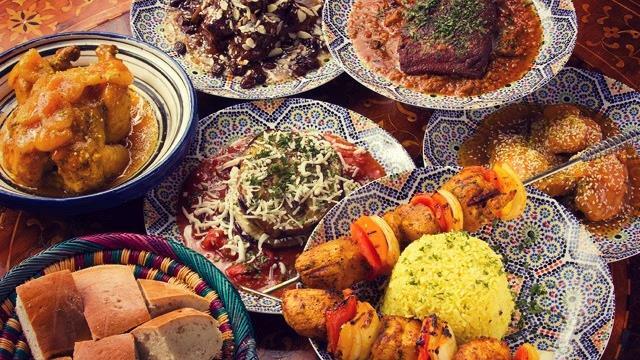 Enjoy a 5-Course Royal Feast Dinner at Marrakesh Moroccan Restaurant. The menu: 1. Traditional Lentil Soup; 2. Moroccan Salad; 3. B'stilla Appetizer 4. Main Course: Tagine of Chicken with lemon and olives or honey and prunes or apricots OR Tagine of Lamb with eggplant OR Couscous with 7 vegetables. 5. Fresh Mint Tea. Marrakesh Moroccan Restaurant is a delightfully intimate restaurant that resembles a stylized bedouin tent filled with colorful rugs and pillows perfect for relaxed conversation. Common table for all guests to sit together. Drinks are not included in the ticket price.